A couple of Sundays ago I was invited to the home of Justin Vrakas to watch some playoff football, enjoy a few beers, and of course…talk watches. Justin is the founder of watchsteez.com – an online showcase of carefully curated vintage watches that focuses on affordable, unique chronographs. Besides bookmarking his site, you can follow him on Instagram @justinvrakas to get first dibs on new inventory AND see more of his personal collection. It wasn’t until several years later that he settled on the exact GMT-Master to buy. His grail watch would be a GMT-Master II, combining the best of both worlds: The iconic ‘Pepsi’ bezel with the latest technology from Rolex. That meant his GMT had to house a calibre 3186 (the movement with the blue Parachrom hairspring - a modification producing more accurate timekeeping). Unfortunately, when Justin was window-shopping for his first Rolex, the aluminum ‘Pepsi’ bezel version was long discontinued; replaced with the sleek Ceramic bezel model. While a person in this day-and-age could easily track-down an out-of-production modern watch on the gray market, for his first Rolex, Justin wanted the full experience that comes with buying from an Authorized Dealer: peeling-off the stickers, a salesperson sizing the bracelet, a warranty card being filled out, etc. Also steering Justin towards shopping with an AD was the fact that his family has owned and operated a jewelry store for decades. Supporting ADs, whenever possible, is how Justin prefers to do business. So, he ended-up with the Ceramic GMT: It checked-off everything on his wish list, except the ‘Pepsi’ bezel. In the ensuing years, he ‘liked’ wearing his Ceramic GMT, but didn’t ‘love’ wearing it: The Ceramic was too far removed from the heritage of the GMT style he originally fell in love with. 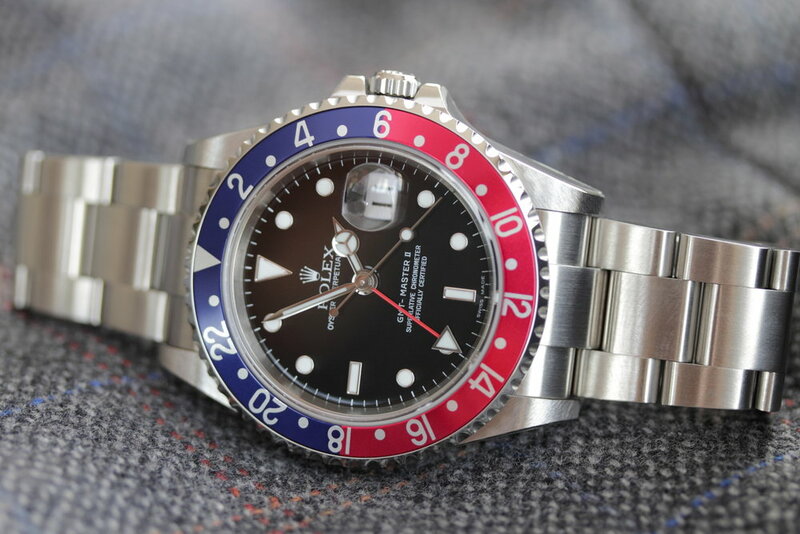 When Rolex did reintroduce a GMT with a ‘Pepsi' bezel, it was in white gold with an MSRP of almost $40,000...It seemed the only way Justin could acquire a stainless steel ‘Pepsi’ bezel GMT-Master II would be buying preowned. In the meantime, Justin bought a few more Rolex. At the AD, he couldn’t help himself from casually mentioning that he was "on the hunt" for a 2007 ‘Pepsi’ GMT-Master II. Because Justin was a valued client, the owner let it be known that he in fact had the "exact watch" Justin wanted - stowed away in the store safe. The story goes: The dealer was saving it to give to his son. Justin couldn’t believe what he was hearing: He had a bead on his grail watch! Trying to intercept a Rolex earmarked for someone usually ends up being a losing battle. The sentimental reasons for handing-down a watch are strong enough to withstand even the most generous offers. Justin realized it was a long shot that he’d score this GMT, but his intentions were honest, so he respectfully inquired about the possibility of purchasing. On a monthly basis, Justin stayed in touch with the dealer to feel him out. As the two spoke regularly, they became more candid with each other. During one chat the dealer hinted that, disheartening as it was to say, his son was really NOT that into watches. For the first time, Justin sensed the dealer’s hesitancy about giving the GMT to his son. The dealer knew how much Justin wanted the watch. Hypothetical negotiations had already taken place between them, and Justin made it clear what his best offer was. IF he decided to sell, the dealer could easily get thousands more on the open market. Why would he leave money on the table and sell to Justin? In the middle of a workday Justin received a call from the dealer. His words: “I’ve decided to sell you the watch” momentarily paralyzed him. He asked how much; fearing the worst. To his surprise, the dealer actually met Justin’s terms. The dealer’s motivation was never to sell to the highest bidder. Rather, his goal was to find the watch an owner who would treasure this exceptional GMT-Master II. When his son’s interest-level fell short, he felt extremely comfortable choosing Justin to have the watch. Up to this point, Justin had never physically seen the watch. The dealer did text Justin a photo with the caseback removed to confirm the 3186 movement. When he was finally at the counter, he recounted the buying experience as being surreal. 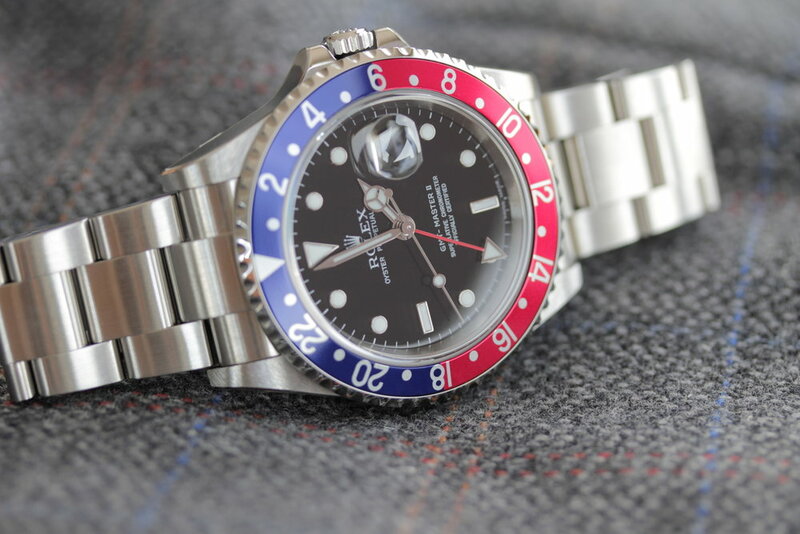 He was presented an M-serial GMT-Master II, with a ‘Pepsi’ bezel that was truly a new-old-stock example. It’s like he traveled back in time: It was 2014, yet he was buying a watch as if it was present-day 2007 AND relishing the same transaction that would’ve taken place back then: popping-off the bezel protector, sizing the bracelet, peeling-off the lug stickers, the whole nine yards. And the best part…the warranty card was already filled out with his name, the date, and official AD stamp; the warranty period for his 2007 watch had actually just begun! When Justin tells me he’ll keep this watch “forever”, I wholeheartedly believe him. Context can make all the difference in determining how meaningful something is to someone: This was the first Rolex that captured his imagination. Having the rare opportunity to acquire a pristine example from the original owner, who also happened to be an AD, is a once-in-a-lifetime occurrence Justin is truly grateful for. He most likely owns the very last 16710 ever sold by an Authorized dealer: A pretty cool anecdote for a Rolex collector!